I'm really enjoying designing t-shirts lately. This idea came from a night at the pub listening to a couple fantastic bands. A few of us were discussing the Angry Birds shirts I did, and then we saw the stamps we'd been given at the door were of a little monkey. 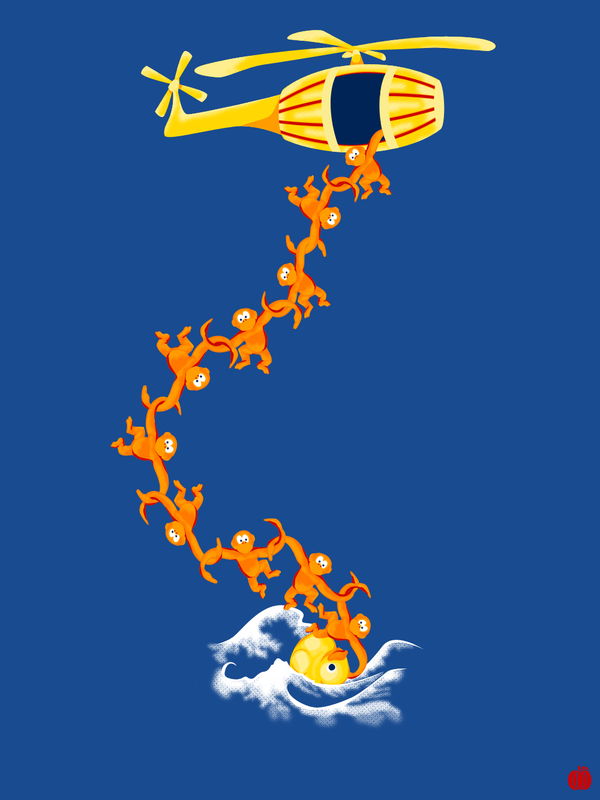 We started talking about monkey t-shirts, and someone suggested turning the Barrel of Monkeys monkeys into SARTechs. SARTechs are Search and Rescue Technicians, and pretty much have the coolest job in the CF. They where bright orange suits, hence the colour, and SAR aircraft are painted red and yellow, hence the barrel that's been turned into a Cormorant helicopter. Ah! I love this - I think it's my favourite of your t-shirt designs so far. It's so original and very personal to you and your friends/colleagues. Great work there! When are you putting these up for sale in your Etsy shop? I decided just to put them on redbubble (http://www.redbubble.com/people/redpumpkinart/works/8357593-teamwork) because it's just much easier than printing them up myself. I guess I'm kind of lazy that way, but I say it's because I'm busy making other things!